GOOD Magazine featured this coat designed to help the homeless, and employ them. 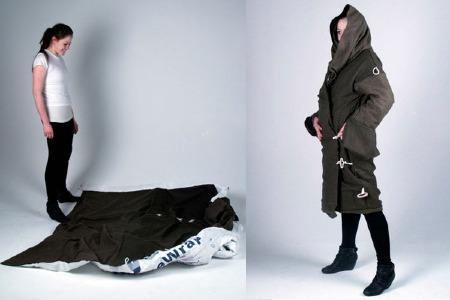 Design student Veronika Scott envisioned a way she could help, by designing a coat which could allow homeless people to stay warm, but also preserve their dignity. This is patronising, self-indulgent rubbish, I’m afraid. I couldn’t agree you with you more. can homeless people afford it? ^^^ damn, you beat me to it! The best way to help homeless people is a coat? hey i like you coat idea, my name is Christopher Wisdom a current architecture student of Morrisville State College and me and a couple of my college mates are working on a homeless shelter; the basic design of the shelter is already finish and we now exploring the ideas of insulation and i was wondering if you have any idea or feedback on insulation (i know you had use wool and tyvek). As an inspiring product designer, this is not one of the products I would ever want to design. It makes me question, how does it end the problem of homelessness? Or does it even promote it? I think design can definitely change the world, but only if it was inherently sustainable. Not just with materials but all the systems associated with it.